The start of this year's season has been a torrid one with four of the five scheduled displays cancelled due waterlogging of the airfield and car parks plus some forecast weather, and most tragically, the loss of a pilot, Trevor Roche and his de-Havilland DH53 in a fatal incident just before the July's Military Pageant. 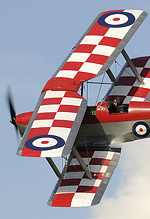 Steve Buckby reports from Old Warden. Photography by the author, Catalina Buckby & Ian Matthews. The day's events began with a tribute to Trevor from the collection's operations director, Sir John Allison followed with a minute silence which was immaculately observed. As a former collection chief pilot Trevor was current on most of the collections aeroplanes (excluding the DH Comet and Avro Anson) but his favourite was the Sopwith Triplane. 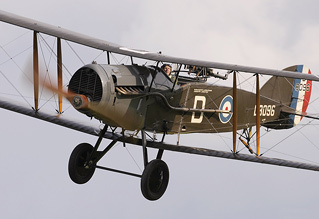 Roger "Dodge" Bailey (Trevor's successor in the chief pilot role) took off to display the little First World War fighter to honour his colleague. The soggy state of the airfield meant that the heavier aircraft such as the Gladiator and Lysander were left on the side-lines with the lighter aeroplanes coming to the fore. A trio of trainers, Avro Tutor, Blackburn B2 and DH.60X Moth (complete with union flags waving from the struts), flew a tight presentation of formations and solo aerobatics. The barnstorming team of Tiger Moth, Magister and Chipmunk is always a crowd pleaser and their demonstration of flour bombing, balloon bursting and washing line limbo went down well with the sizeable throng. 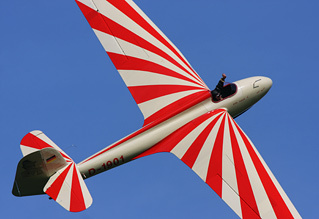 Hot foot from the 126th Annual Wenlock Olympian Games Gliding Competition was the amazing Christoph Zahn and his DFS Habicht glider. Christoph was obviously enjoying himself immensely, punching the air and whooping with joy whilst holding the vintage glider on a final knife-edge pass before turning to land. Other Teutonic interest in the show was Peter Holloway in his wonderful Storch who got involved in a slow speed dogfight with Frank Chapman in the Po2. A Great War trio of the Bristol Fighter, Sopwith Pup and SE.5a brought the main component of the display to an end. After which it was time to break out the Edwardians! Conditions were absolutely ideal with not a breath of wind in the wind sock, first up was the Deperdussin from 1910, the noise from its little 35hp Anzani engine almost drowned out by the sound of camera shutters. With the Deperdussin safely down it was the turn of the Avro Triplane and Bristol Boxkite, the two movie replica aircraft treated the crowd to an extended demonstration that went on for almost half an hour. The evening's entertainment rounded off just as it started with another of Trevor Roche's favourites, in the hands of Dodge Bailey in the world's oldest airworthy British aeroplane, The Blackburn Type D Monoplane, which celebrates its 100th anniversary this year. Although Old Warden shows can be very much alike in content, they provide a perfect relaxed atmosphere to enjoy a summer's evening picnicking with friends and the extended family of the Shuttleworth Collection. Although this was not the first airshow of the season it was the first to be blessed with civilised weather. Let's hope that Old Warden receives more good fortune for the rest of the season, it deserves nothing less.